The House That Love Built is by Beth Wiseman. My initial impression of the book was incorrect. The story begins rather slow and while I thought that it was “OK” I felt that it would probably take me quite awhile to read. It just did not have the special “something” that kept drawing me back and I did not let other things go just so I could read. But sticking with it turned out to be an excellent idea. 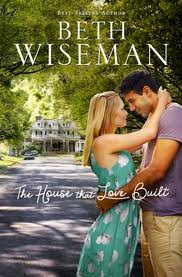 This book is a love story – pretty obvious – The House That Love Built – but it is so much more. There is much to like about this book. If you enjoy reading about charming small towns, Wiseman describes Smithville, TX with an old-fashioned postcard picture feeling. Smithville is a lovely town, complete with architecturally beautiful historic buildings. It is a place where children can walk places alone and where excellent restaurant meals can be had at a café that is not a chain. If you like rehabbing and restoring a beautiful old house this story will resonate with you. As someone who has been involved in several housing projects, the disappointment in having a paint color that looked great on a paint chip look absolutely awful when translated to a wall struck a chord with me. Who knew that purple could look that dark and foreboding? Then there was the disaster of discovering that the old roof leaked like a sieve during a hurricane. But it all is worthwhile when you feel the thrill that comes with bringing a rundown historic home to its former beauty, refitted for contemporary living. Several story lines play out in this book, giving the plot a complexity, knit together in a beautiful, complete whole. The book takes the time to “fill out” the characters with descriptive passages that bring them to life. This is the love story of the protagonist, a young widow and an embittered divorced man, Booke and Owen. Brooke comes into the novel with no thought of marriage in her mind and Owen just wants to rehab his house to spite his ex-wife. It is also the story of Brooke’s parents whom after years of separation, discovered love just in time. Through historical information revealed on Owen’s rehabbing project he discovered a tragic love story of the couple that built the house back in the World War I era. They were parted forever by the war. This is juxtaposed along with the contemporary love story and brings the old renovated house to life. Other secondary story lines flesh out the book with an added richness. This is a story of love and redemption for the town’s “bad boy” who finds family and completeness. Also, about a bachelor in his 70’s who finally fulfills his ultimate bucket list in Smithville. Plus it is a story of a newborn girl who wins everyone’s heart. And finally, most importantly, a message that God’s love continues through even times of great difficulty. That is a lot of love. So besides enjoying reading of small town life and the descriptions of a beautiful renovated house, I was touched by the redeeming message of what genuine caring did for a teenage boy who had never had an adult love and care for him. The ability of a tiny, newborn baby to draw a disparate collection of people together was pretty neat. And the reconciliation in Brooke’s family was satisfying. And I loved being reminded of God’s faithful, unconditional love. Different threads with different characters have storylines in this book but the diverse strands are all drawn together through love, a common theme. I definitely recommend this book. I received this book from the publisher in return for a review. All opinions are my own. Brooke has only loved one man, her late husband. Owen's rebuilding after a painful divorce. Can a mysterious house bring them together for a second chance at love? In the charming town of Smithville, Texas, Brooke Holloway is raising two young children on her own, supporting them by running the family hardware store. The last thing on her mind is falling in love. But she's intrigued when a stranger moves to town and buys the old Hadley mansion. She's always heard that house holds a secret-maybe even a treasure-and she can't wait to see inside. When she meets the new owner and they spend time together, she can't deny the attraction. Could God be giving her another chance at happiness? Or is she betraying her late husband's memory by even thinking that way? Owen Saunders bought the Hadley place to spite his cheating ex-wife. She'd always wanted to restore an old house in Smithville. Now he's going to do it without her. But if anything needs restoration, it is Owen's heart. Then he meets Brooke and her kids and finds himself tempted by love. Can he bring himself to trust a woman again? Throw an eccentric uncle into the mix, along with the town's teenage troublemaker, and even a finicky cat-and one thing becomes clear: God is bringing them all together for a reason. Beth is a Carol Award Winner, Inspirational Readers Choice Winner, INSPY Winner, and the best-selling author of the Daughters of the Promise series and the Land of Canaan series. All of her books have held spots on the ECPA (Evangelical Christian Publishers Association) bestseller list and the CBA (Christian Book Association) bestseller list. She grew up in Houston, Texas and now resides in a small town west of Houston with a population of around 300.
husband, two dogs, two cats, two pot bellied pigs, two chickens and a pygmy goat. Her two grown sons also live in Texas. Beth has been writing in some capacity for most of her life. She's a former award-winning journalist with eleven honors, including 'First Place News Writing' for The Texas Press Association. However, writing love stories with a spiritual message is where her heart is. When Beth isn't writing (which is seldom these days) she enjoys traveling, cooking, fishing, reading, or just settling in for a good movie. Her best times are spent with family and friends! Very good review. I just asked my wife if she would like some books from this genre for reading ... gives me birthday and Christmas gift ideas. Thanks.